Gather 'round gamers, let’s rap. I’d like to talk with you today about a very serious issue in the gaming medium. I’m talking about drugs. And not those harmless street drugs, I’m talking about drugs in video games. Wrong. Drugs are hella lame, and they’re even hella lamer in video games. As we have been told again and again and again everything that happens in video games will eventually translate into real life. That’s why I ride a green dinosaur to work and pick up health kits to replenish my life bar. You see, highly intelligent and up-to-date individuals like politicians and academics know what’s best for you and me, so when they tell us that the portrayal of drug use in video games is a naughty naughty thing, it’s super important that we believe them and lay off the digital smack. Don’t believe me? Just take it from my man Senator Joe Baca. Not only do video games let you use illegal drugs, but they let you use them to car-jack soccer moms! Science says so, debate over. Thankfully, there are some organizations working hard to censor or penalize developers who choose to portray drug use in video games. Sometimes the benevolent hand of the nanny state steps in to shield us; Fallout 3 for example, was banned in Australia for its portrayal of drug use. In other cases, independent organizations like the ESRB are stamping their ratings on new games as they are released. Simulated drug use is one of several factors along with violence, big boy words, and the sinful exposure of the human body that the ESRB uses to tell us right from wrong. With their help our beloved gaming medium is moving closer and closer to that bastion of moral purity, the movie industry. The awesome thing about third party rating systems and government intervention is that little people like us don’t have to do any of the thinking ourselves. Gnarly! Bioshock, Starcraft, Super Mario World, Left 4 Dead, Grand Theft Auto, Oblivion, Fallout 3, Pac-Man, Hitman, Manhunt, Silent Hill, Sam & Max, inFamous, Leisure Suit Larry, Far Cry 2, Twisted Metal, Final Fantasy Tactics, Tom Clancy's Splinter Cell, Max Payne, and so on. 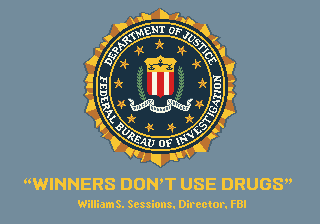 Also, if you see drug use in a video game, tell an adult right away. If you are an adult, flush the game down the nearest toilet. There may be absolutely no evidence that drug use in video games leads to drug use in real life, but with a little moral indignation and some good old-fashioned panic we can keep our kids and ourselves safe. Remember, gamers, only losers are users.